Introducing Tennant's T1B micro scrubber. The T1B is perfect for scrubbing those hard to reach areas in your facility. The T1B comes with AGM or lithium ion batteries. The litium ion batteries provide twenty times longer battery life. 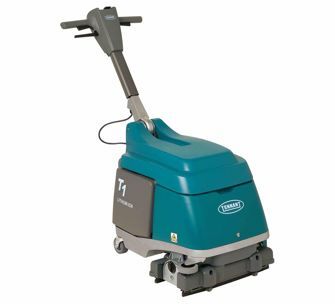 Tennant's T1B is a 15 inch cylindrical scrubber that is equipped with squeegees both in front of and behind the cleaning brush. This dual squeegee design allows you to clean both forwards and backwards with the machine. This model also comes standard with a folding handle on it which allows for compact storage. The T1B is manufactured with a cast aluminum frame, and scrub head. This design makes this machine both corrosion resistant and durable. With rotational molded tanks, you can be sure the body of this machine will last.